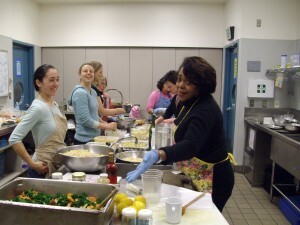 CommunityKitchensNW is cooking up community! We are here to link you to resources and help you get your own kitchen going, to let you know what kitchens are in your area and to let people know how to support community kitchens throughout the Northwest. What’s This Community Kitchen Idea, You Ask? Simply….it is coming together around food in a common community space– to cook together, to learn together, to support one another, and to share resources — all in the name of health, wise use of resources, and community connections. The formal “community kitchen movement” has its roots in Peru in the 60’s & 70’s. Since then, it has been put to use across the globe……..with Canada’s CK movement spreading & taking root since the 90’s. We look to what British Columbia has created – with nearly 400 community kitchens across the province and more than 60 CKs in Vancouver alone. It is also intended to bridge cultural and socio-economic differences.